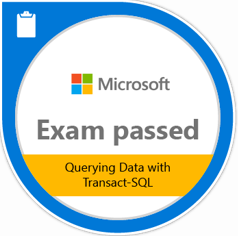 I have passed the 70-761 Microsoft exam on 2018-06-21. Using T-SQL is the first programming language that you should master if you want to be a data scientist or PowerBI ninja – whichever is cooler. There is an ocean of beginner level study sources, try to avoid the worthless kind. Try Paul Scotchford’s classes on Udemy first. I prepared for the exam by reading the Exam ref book and practicing with the practice test from the Microsoft Press Store. reading and understanding the exam ref book for a second time was much easier. The exam was very difficult. There were some questions that were tricky or just not clear for me. For some questions you are required to type in the code which is a lot more complicated than choosing the right one from multiple solutions. I had used all the 120 minutes to answer the questions. I recommend practicing test taking by either using practice tests or learning languages with the Duolingo app. When you have 8 different possible answers you have to scan them fast for obvious and not so obvious errors. You are given a laminated pad that you can use to take notes. You can write down the letters of the possible answers and cross them one by one. The book is not for beginners but otherwise very good, I plan to read it once in every three months because it helps you use T-SQL more effectively.